Billion and 4 other Taiwan Excellence companies participated in Smart Cities India Expo, New Delhi from May 10 to 12 and showcased Smart ICT solutions.VIP delegates and officials from the Taiwan, including Vice Minister, Ministry of Economic Affairs (MOEA) were all part of the expo. Billion was also invited to give a speech about the intelligent lighting control and solar energy monitoring system during the event. "Taiwan Excellence Award" winners are chosen based on five key indicators: R&D, Design, Quality, Marketing, and Made in Taiwan. The five indicators are of equal importance, and each is judged on its "Innovation Value," the most important standard of all. Products that receive the "Taiwan Excellence Award" are authorized by the Ministry of Economic Affairs (MOEA). 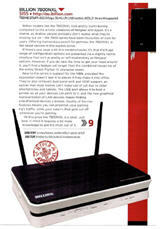 “An Affordable Router with Valuable 4G WAN Failover and Decent VPN Performance".
" The router can present up to four virtual SSIDs and enforce client isolation to stop wireless users from seeing each other"
Billion's BEC MX-1000 and Smart Streetlight Control and Management System (LCMS™) receive the Technology Innovation Awards in the "Broadband and Networking" category named by Taiwan External Trade Development Council (TAITRA) and Taiwan Electrical and Electronics Manufacturers' Association (TEEMA). “Solid performance from a device that doesn't fall into the Fast Ethernet trap." 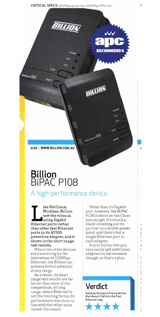 “Excellent security features and strong performance make the Billion a great buy for demanding environments.”. 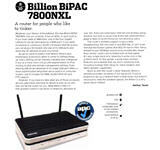 “The 7800N has great wireless throughput and is a solid base for your ADSL2+ network."